Pat’s home looked okay from the outside. She did what she could to keep the exterior in good condition. But inside, the house had deteriorated. She didn’t have the money or the strength to make repairs on her own. Thankfully, Burke United Methodist Church (UMC) stepped in to help. They came just in time, making necessary repairs to improve Pat’s health and safety. House Captain Michael Holmes led the entire rebuilding effort including recruiting and motivating volunteers, and keeping the repair work on track. To Michael, lending a hand is second nature. He reflected on the meaningful work during the construction. A Burke homeowner, Pat needed to repair her home to address homeowner association concerns and safety issues. The dedicated Burke UMC volunteers touched every room of her home to make this possible. Their 37 enthusiastic volunteers donated over 800 hours of their time to help. Now, her home is safe and healthy. Pat feels especially grateful for one volunteer from Burke UMC, Jane Wilson. Jane offered gentle encouragement throughout the process. They worked together to sort through piles of papers, organizing them into clearly labeled boxes. “Jane helped me let go of things,” Pat said. We also connected Pat with other resources, to help her receive a working refrigerator. For three years, she could only keep shelf-stable food. We referred Pat to the Virginia Weatherization Program, and they provided a new refrigerator. Now, Pat can store fresh food in her kitchen. Inside the home, Burke UMC volunteers worked on the drywall and added fresh coats of paint. They also repaired electrical and plumbing problems in her kitchen and bathroom. Clearing away clutter, the team replaced worn flooring and repaired broken doors. Outside of the house, volunteers repaired entry stairs and railings. (This will prevent falls and injuries, common problems for elderly and disabled homeowners.) The team also fixed drainage issues and mowed the overgrown yard. Little by little, these improvements made the home more welcoming and comfortable. Inside and out, the house truly became a place to feel at home. For every repair and modification project, we track impact based on our 25 Health and Safety Priorities, which encompass fall safety, fire safety, moisture control and ventilation. Pat’s house had 18 issues that needed to be addressed, and Burke UMC volunteers resolved all of them, an amazing effort by a committed group of volunteers. The work took place during April, National Rebuilding Month, our signature event. 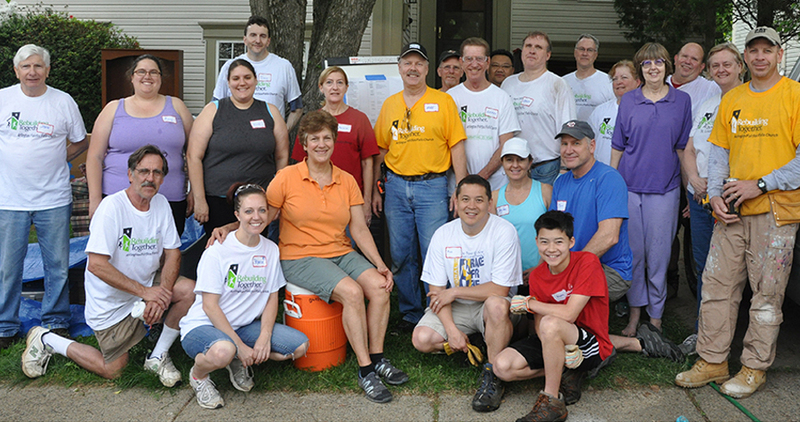 We celebrate this month every year with 30 partner organizations who join us to make repairs and modifications for low-income homeowners and non-profit facilities. The event culminates on National Rebuilding Day, the last Saturday in April, when more than 800 volunteers work together around Arlington, Fairfax and Falls Church making critical repairs like building new steps with hand rails, fixing plumbing leaks, modifying bathrooms for wheelchair users, replacing windows to make homes safer and more energy efficient, and so much more. 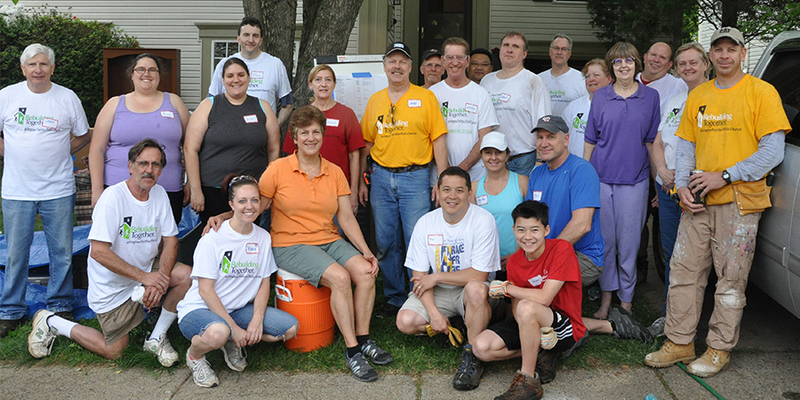 National Rebuilding Month is celebrated all across the United States when Rebuilding Together Affiliates mobilize 40,000 volunteers to repair 1,600 homes, nonprofits and community spaces. Would you like to get involved with hands-on volunteer work? Your time and talents can make a real difference for low-income homeowners. Please get in touch with us, and we can connect you with volunteer opportunities that match your interests, your skills, and your schedule.